Gear S2: How can I change the watch face for my Samsung Gear S2? You can change and customize the watch face on your Gear S2, in addition to creating new watch faces with you own customizations. Note: The screens and steps shown below may vary by wireless service provider and your mobile device. All changes you make to the watch face on your mobile device will automatically update on your Gear S2. 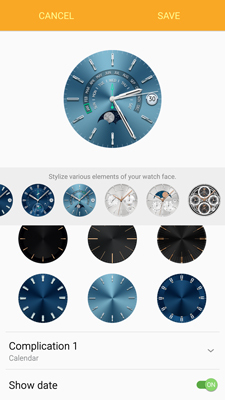 Create new watch faces while preserving the watch face templates by scrolling to and touching Create . 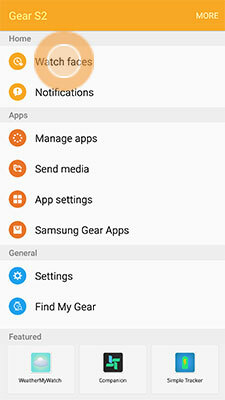 Note: The Samsung Gear application may be located in the Samsung folder by default on some devices. 3. Touch Watch faces . 4. Touch a watch face to select it. 5. 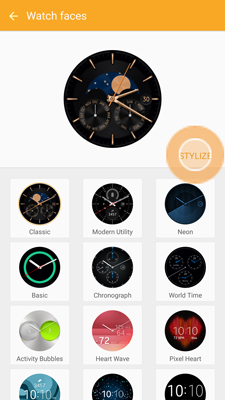 If available, touch STYLIZE to customize the look of the watch face. Use the Create option at the bottom of the screen to create a new watch face without changing the watch face template. 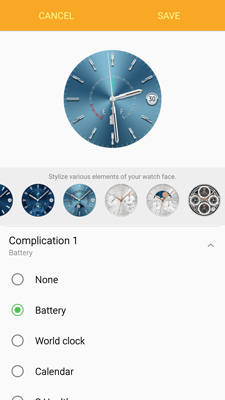 Note: Watch faces offering customization will each have different options. 6. Touch the new dial you want. Note: Your changes will display in the preview at the top of the screen. 7. Scroll to and touch Complication 1, if available, and select what you want to display on the watch face. 8. If desired, scroll to and touch the slider next to Show date to turn off the date on the watch face. 1. Touch and hold the Watch screen. 2. 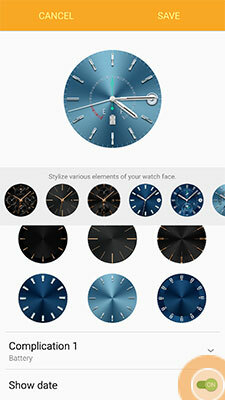 Rotate the bezel to select a different watch face. 3. Touch the watch face you want to select. Note: If available, touch STYLIZE to customize the watch face. Rotate the bezel to view your customization options. Touch OK when you are finished.